An old foundation along the Delaware Ridge Trail. The Hike, much like life is a matter of perspective. 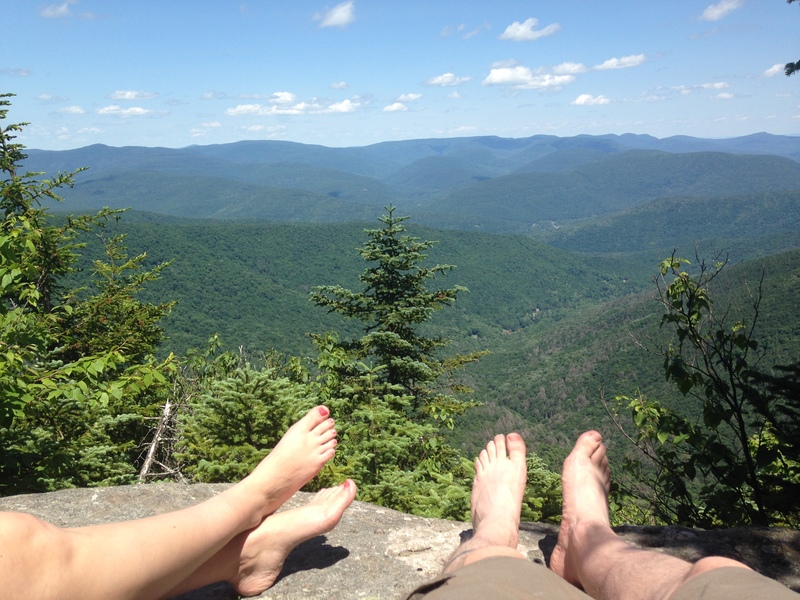 Take our last backpacking trip: a 3 day 2 night hike over 27.3 miles in the Western Catskills, on a series of trails known collectively as the Delaware Ridge Trail. 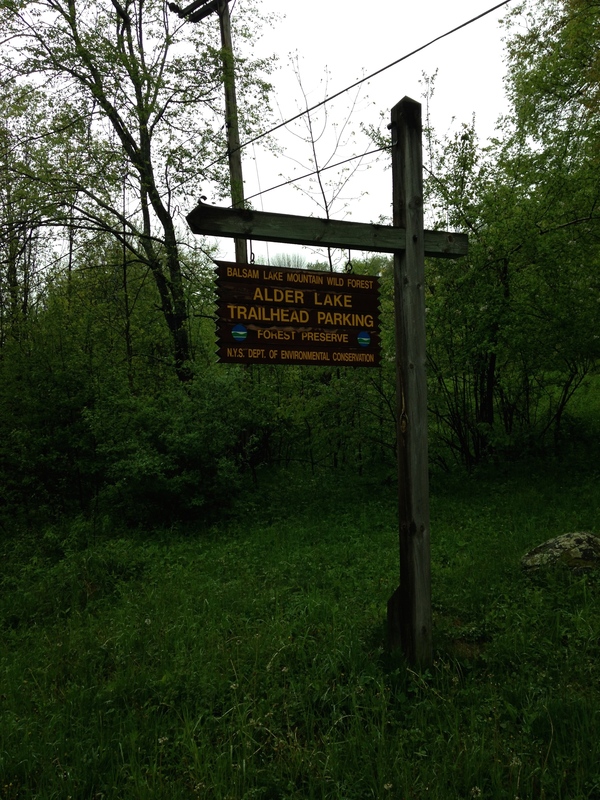 The trail is described in Adirondack Mountain Club’s Catskill Trails Essential Guide, 3rd Edition as the following “… provides a rugged and thoroughly interesting network of trails.” The key word you must read here, and the one to be wary of is “interesting”. We found the author clearly mistook the word “interesting” for hard, difficult, and prepare to suffer! Which brings us back to the matter of perspective. Yes, the hike was difficult and boy did we suffer, however, interspersed with the challenges are things of great beauty and experiences that belong only to that moment. So which will you choose to remember? The suffering and hardship, or the beauty and experience? What we choose to remember of life defines our perspective. Cheryl on a hot and exposed ascent. The conundrum of course is that you can not have one without the other, hardship and beauty seem at times to have been born holding hands. 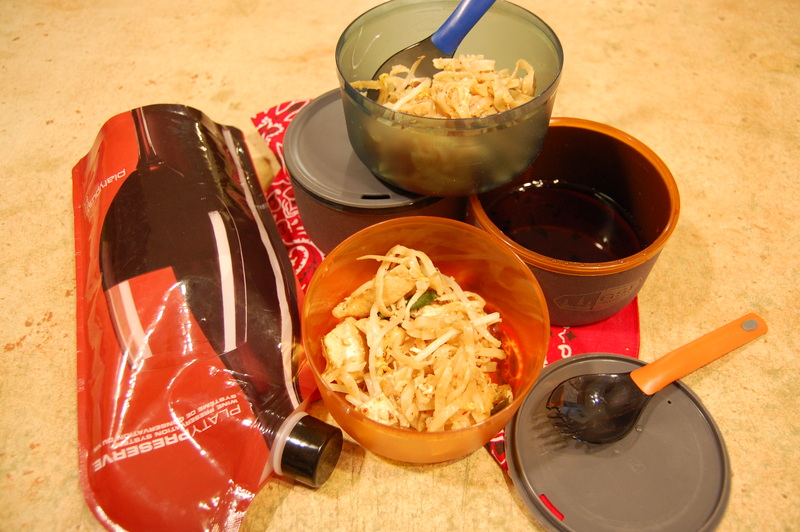 Without the pouring rain the first day, causing her to have to look down and pay close attention to footing, Cheryl may have missed literally stumbling across the fresh ramps she was looking for to complete a Miso Noodle Bowl recipe she was working on. Without slogging straight up mountains where some parasite or blight has taken the trees and left a trail that is a hot scar of weeds, rock and brambles exposed to the sun, would we appreciate as much the gentle grades through pine forest where walking on the fallen needles is like walking on a carpet of the deepest pile? Without emptying our last drink of water and having to hike on for another hour before finding more, does the cold clear mountain stream seem as mystic or vital? Picture Post Card lunch spot. So which will we choose to remember? 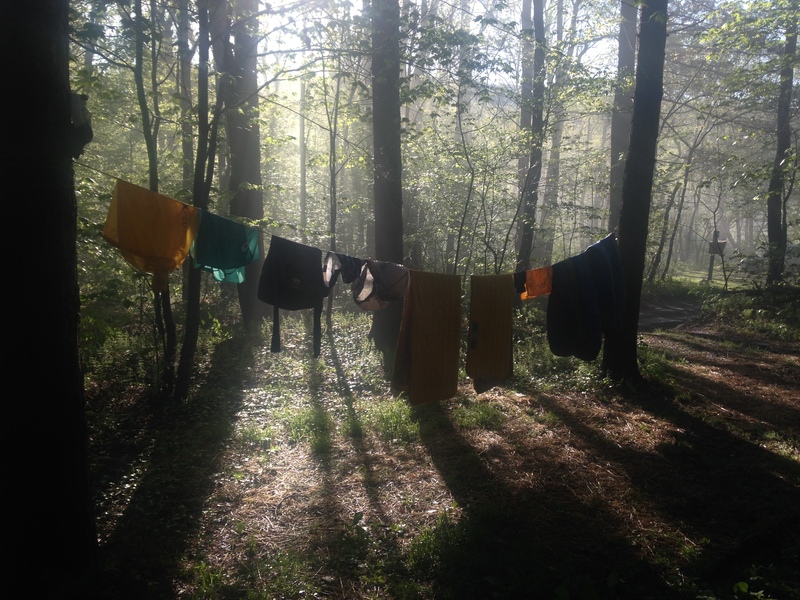 Having to make a cold and wet camp the first night, or the way the rising sun burned away the mist the next morning? Hot exposed climbs that seemed to be prime venomous snake territory, or that Cheryl saw her first bear in the wild (or at least his plump bumbling backside running away from us)? 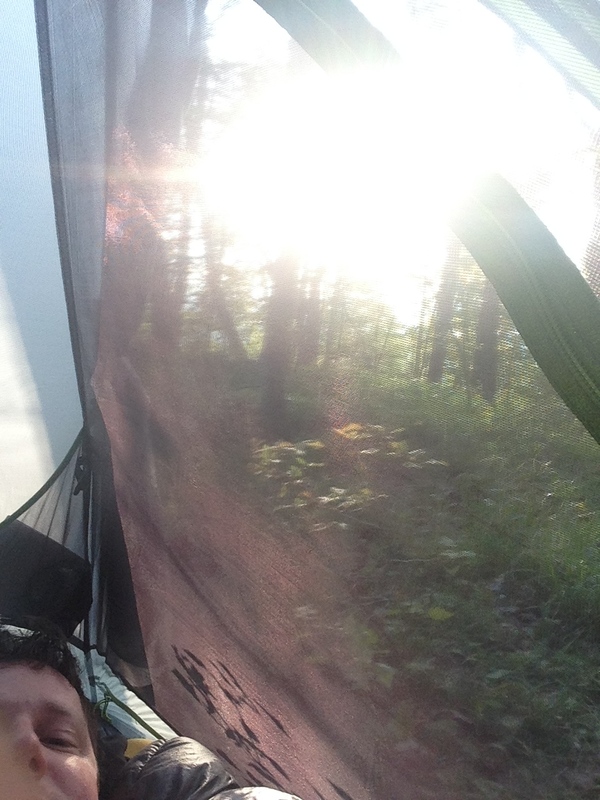 The fact that we got a later start than we wanted and didn’t make it to the scheduled lean-to, or the fact that we found a completely secluded back country camp site and didn’t see another person for 24 hours? Should we choose to remember the feeling of blisters growing underfoot, or the lunch taken in an idyllic meadow of the kind only seen in magazines? Sunrise from the tent the morning of day three. Back at home. Clean again, bellies full and laying in soft fresh sheets, the ache of the exertion of the past days slowly leaves our muscles – leaving us with only the pleasant memories of time well spent. So as it turns out, the Hike is much like life; without the pain of suffering and sadness we do not acutely and fully experience all of the joy and gladness the Trail has to offer. 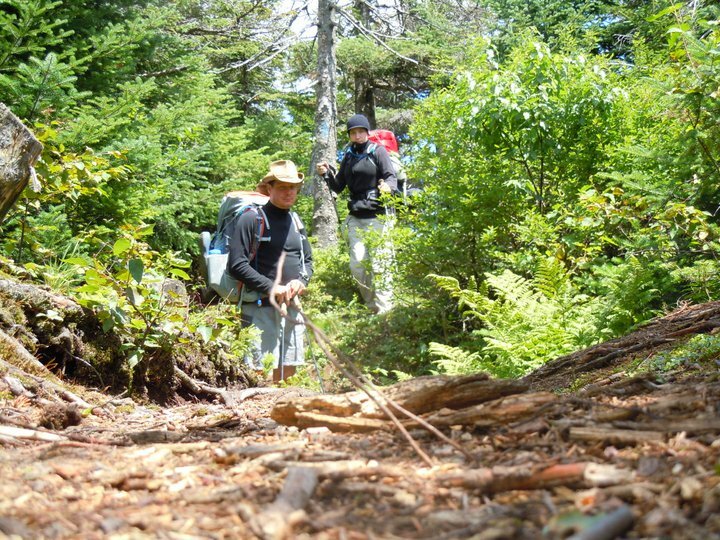 As the author of the Adirondack Mountain Club’s Catskill Trails Essential Guide, 3rd Edition has said, it is all a very “interesting network of Trails”. On your walk keep your eyes open for ramps and when you find them harvest by loosening the bulbous base with your trekking pole tip and then pull up by the stalk. 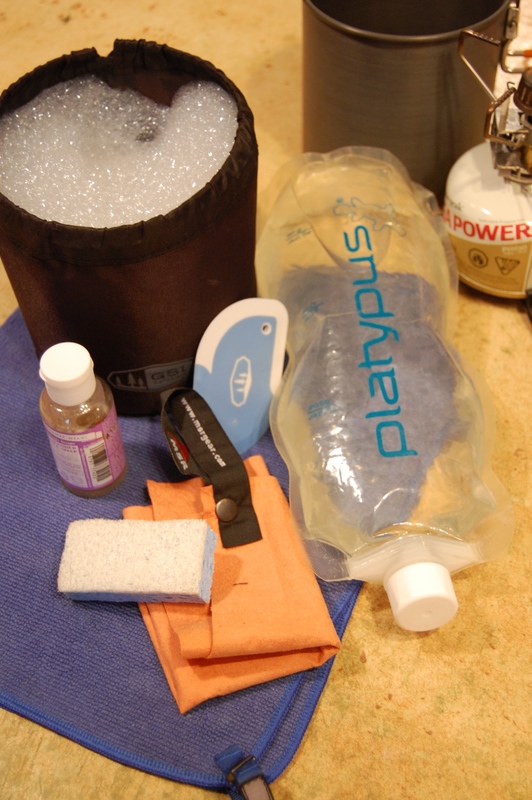 Wash really well – with your filtered water – and toss in your pack where they won’t get too terribly smooshed. In camp add the miso, bouillon and cabbage to the water and bring to a simmer. 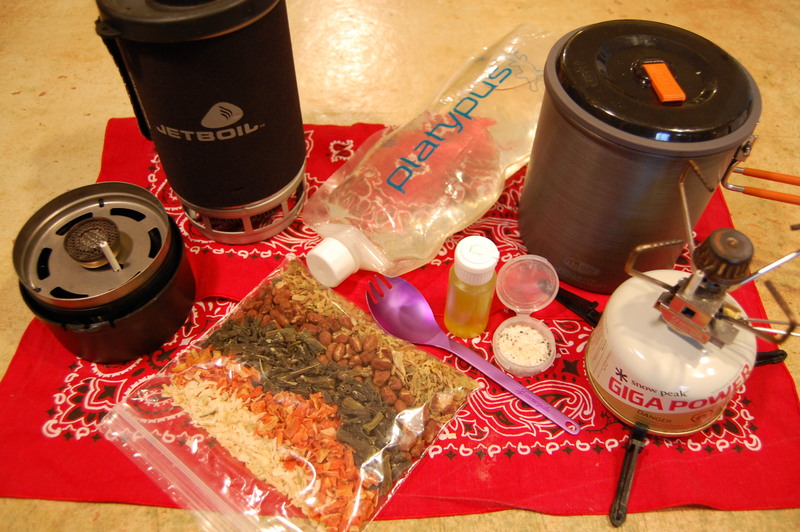 Once simmering add the freeze dried items and seasonings, stir in well until all the freeze-dried items are saturated. Break the noodles in half and place in water, simmering for another minute. Turn off the stove and let rest for 5 minutes. Add two packs of soy, serve and enjoy! This is a great weight saving meal that cooks quickly and doesn’t use a lot of fuel – a win all around – but especially wonderful when its a bit damp and chilly out. 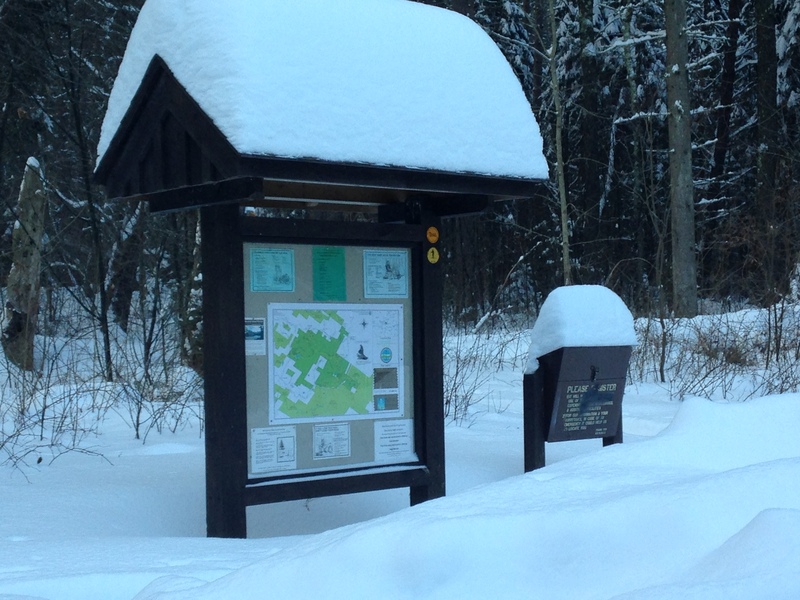 The trail head at the Kelly Cross Country Ski Trail. The plan seemed simple. 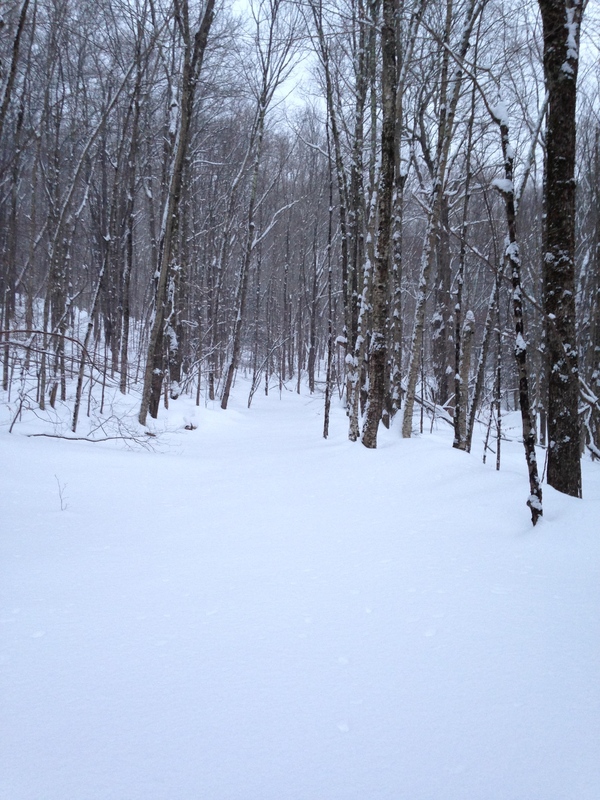 A Valentine’s Day-kick the winter blues-overnight in the Catskills. 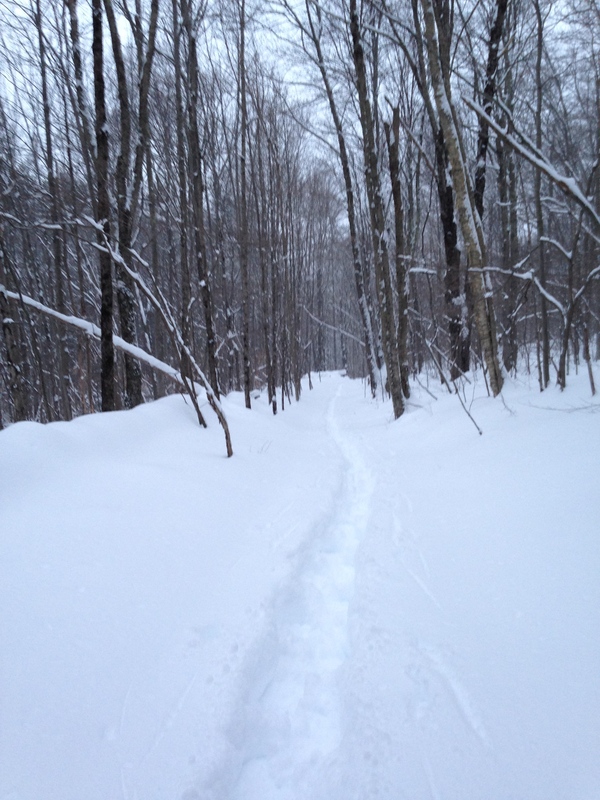 Head two miles up the Kelly Hollow Cross Country Ski Trail to a lean-to shelter, make some killer romantic food and spend the night in zip together sleeping bags in the back country. If the going was too rough, or it got too cold for out taste, it was only two miles…an easy hike out and back to the car. The plan seemed so simple. Things started going wrong the day before the trip. Graham was going to pick up some last minute essentials (and a Valentine’s gift of an REI Habanara winter sleeping bag for Cheryl) before leaving work. Distracted right before he left, he accidentally left the sleeping bag behind. 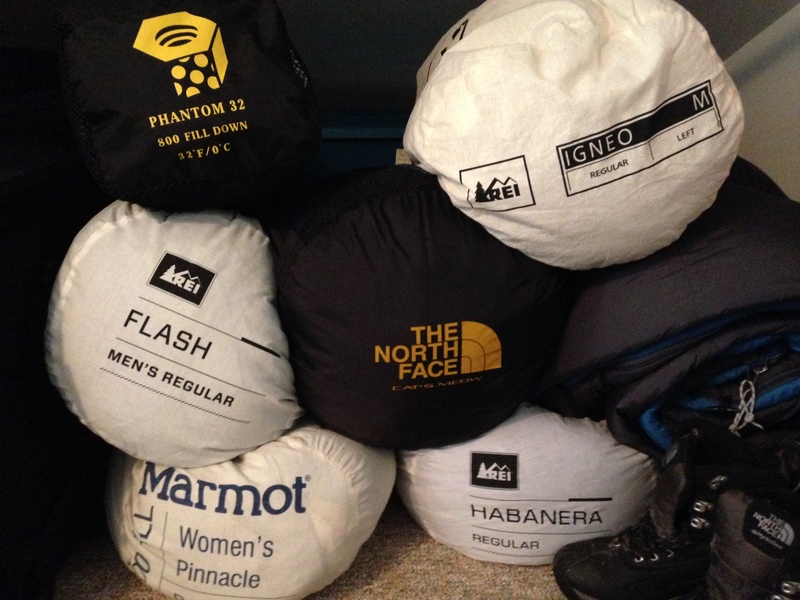 Now instead of methodically packing, that night found them running back to REI to grab the forgotten sleeping bag and eating a less than romantic dinner at the bar of Applebees. No worries, we’ll just wake up early, pack our packs, and roll out for the ‘Skills. After all we’re seasoned professionals, we’ve packed for trips a thousand times before. 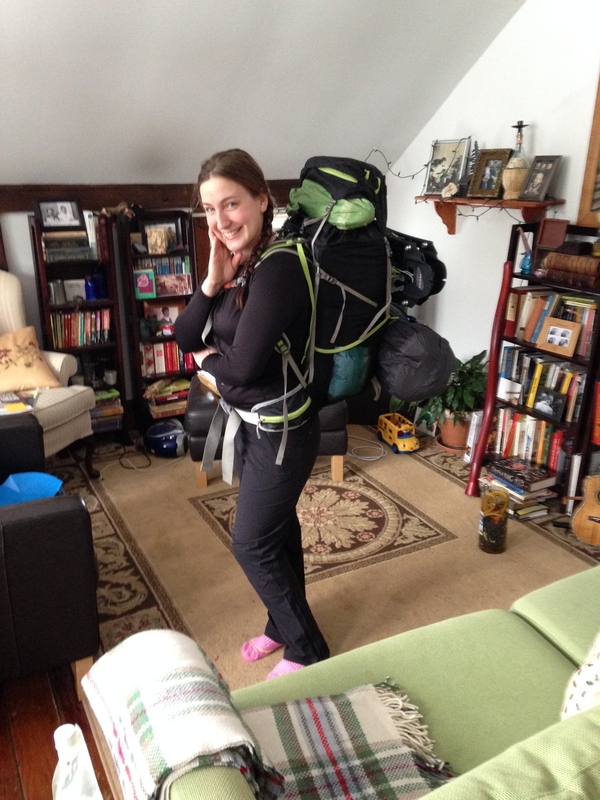 Cheryl all packed and ready for trail. Cheryl knows whats going on here, “I’m finished packing except for the food so I’m going to go out and get some egg sandwiches, you’re starting to get cranky” (After all Graham must have his morning zen). Finally, two hours behind schedule, we loaded Graham’s Subaru Impreza (aka the Adventure Mobile) with cross country skis, snow shoes and all the other gear we thought we would need for a winter overnight. At last, somewhere about 1:00pm we were on the road, and it was snowing. After negotiating the interstates North and some sketchy-at-best local roads we reached the trail head. Two days ago, a storm had brought well over a foot of snow and we had driven through on going snow to reach the beginning of our two mile trip. It was 5:00pm, the snow was deep, and we assessed our situation. We decided it was so deep we would ditch the skis for snow shoes and push forward, after all it was only two miles to our destination and we still had at least an hour of daylight. Two Hungry Hikers on the trail just before dark. Three hours out, we had not yet found the lean to and had reached a point where no clear way was discernible ahead. Not a trail blaze was to be seen and in the dark there where no landscape contours that would give us a bearing on a map. It was hard to tell exactly where we were or how far we had come to get there. The wind was freshening and puffing our words into the cold, we discussed our options; 1.) 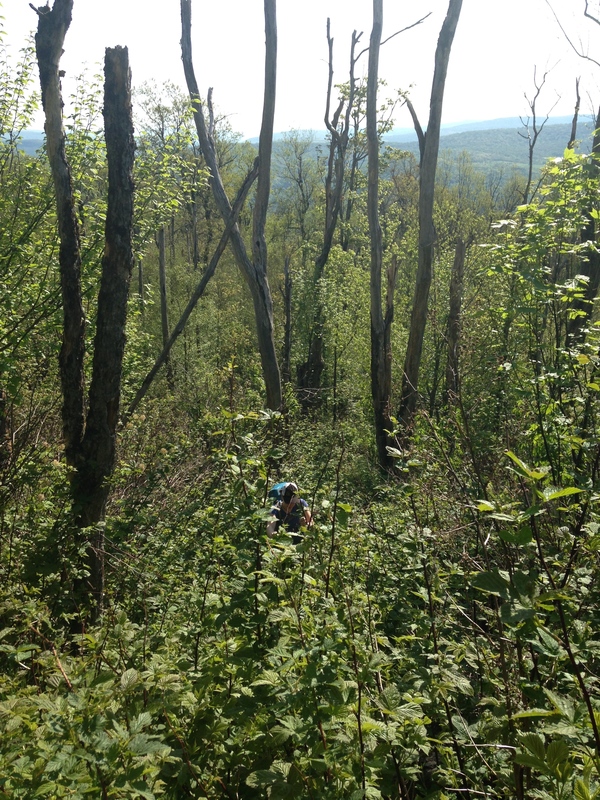 Continue on, hopefully finding trail blazes again that would lead us to the shelter in the dark. 2.) Find a level spot, off the ridge line with some wind protection, set up our tent and bivy for the night. 3.) Head back along the already broken trail to the car. We decided to back track and make our way to the car. Graham set a quick tempo back, head down, putting each foot into the foot print already placed in the snow. He was focused only on the halo of his headlamp, and how the “sluff-whump” sound of his snow shoes combined with the rhythm of his breathing. When Cheryl lead, she did the same, dragging her trekking poles carelessly behind her. Thanks to the “ let’s get the H-E-Double-Toothpicks outta here!” pace what had taken three hours out, miraculously took only 45 minutes to get back. With Graham’s head lamp on it’s last leg, and Cheryl’s left leg cramping we had made it back to the trail head and the car. Now what? 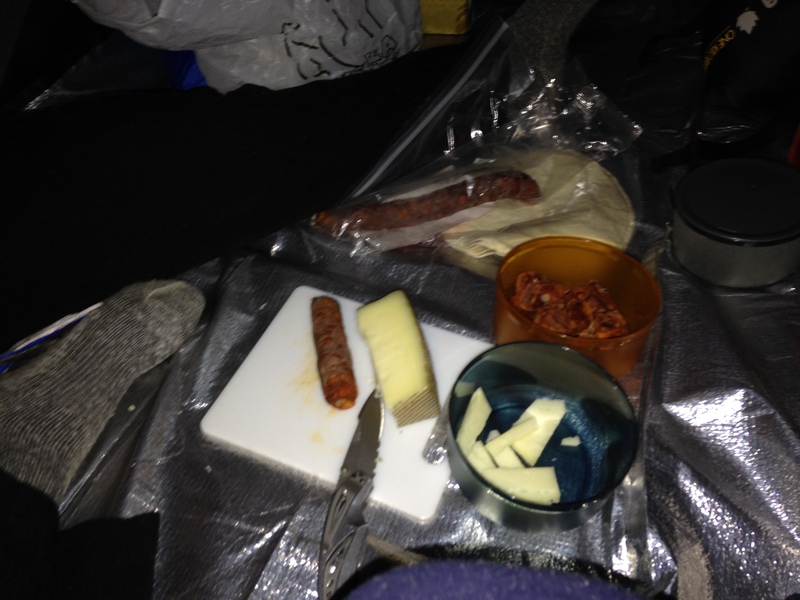 Appetizers in the Adventure Mobile. We started the Impreza for a quick blast of heat, changed into some dry layers and starting arranging gear so we could sleep inside. 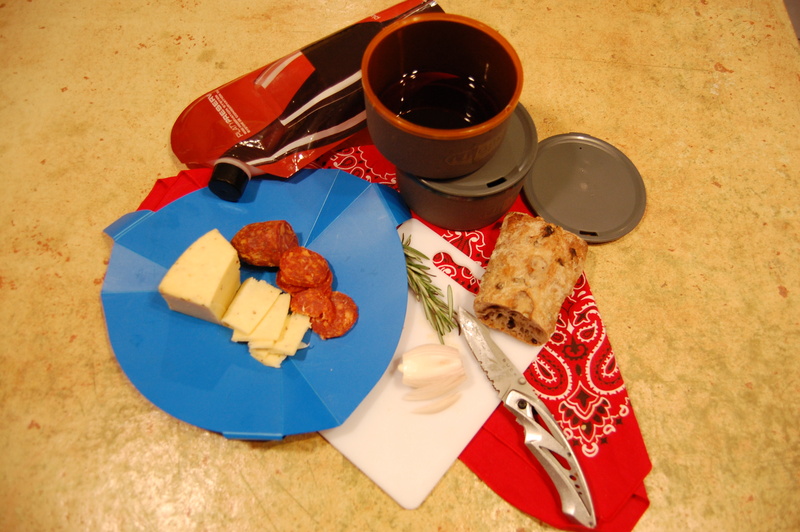 Soon, settled and warm in the the back, Cheryl sliced our appetizer of Chorico Sausage and Manchego Cheese paired with a Spanish Riojo. Meanwhile, between bites and sips, Graham was putting the finishing touches on a Chicken Mole that not only satisfied our hunger, but touched on the romantic with it’s combination of aphrodisiac ingredients. 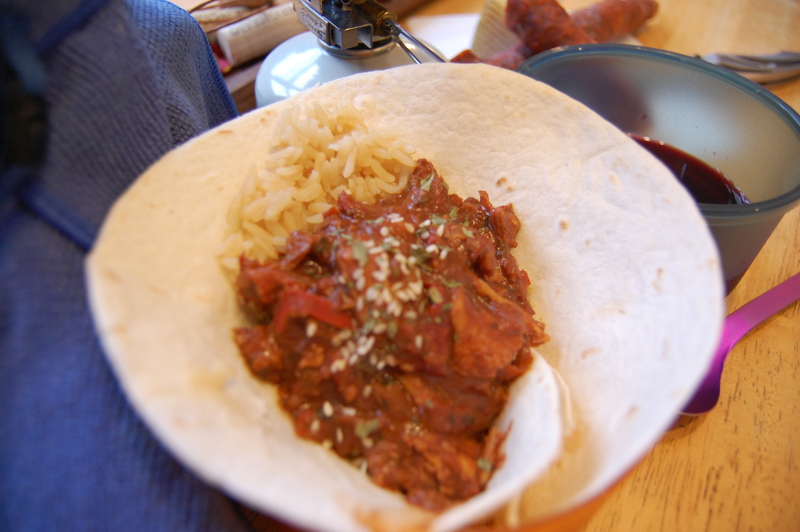 We loaded the Mole with rice into ingeniously folded tortillas and put them in our faces. 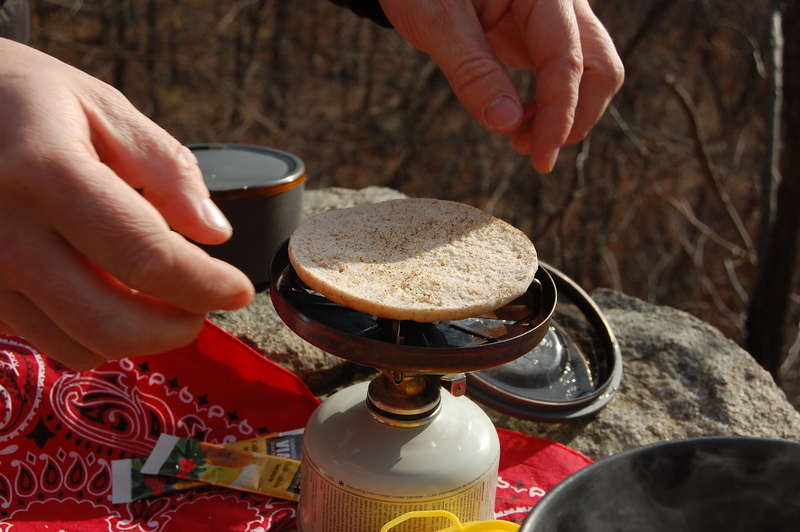 The use of tortillas meant that there were no bowls to wash, and the pots were easily scrubbed out with snow. All cleaned up, we settled into our sleeping bags in the back of the “Adventure Wagon” and slept as well as if we were in our own bed. The Impreza in the morning at the trail head. 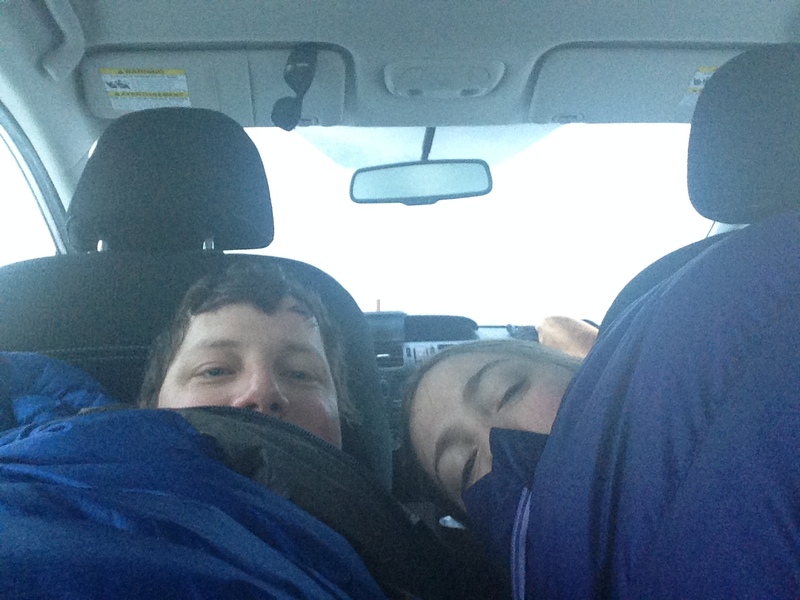 Around 8:00 the next morning we poked our heads from the warmth of our sleeping bags into the 13 degree morning. With a smile at each other we reviewed the lessons learned. Don’t under estimate how long it will take you to pack, how hard it will be to travel in the snow, or the ability to navigate in the dark. 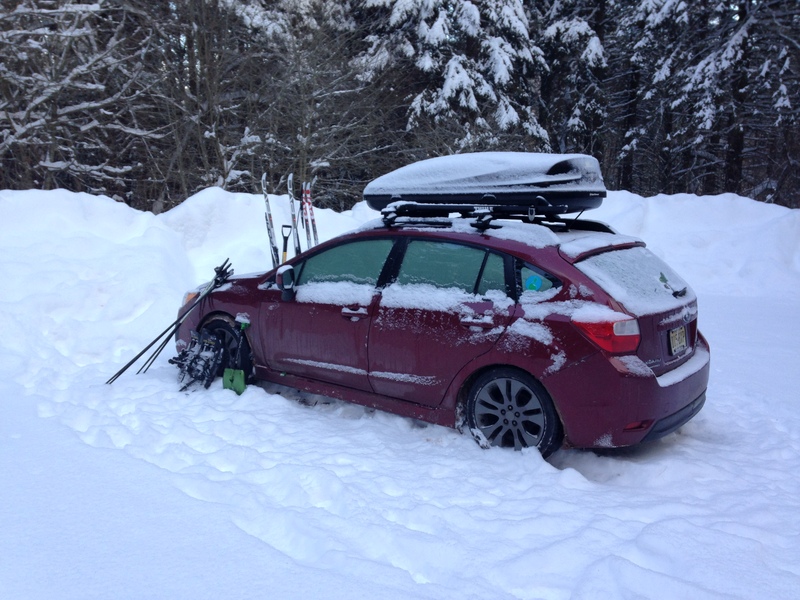 We learned in an emergency situation the Subie will work as a temporary shelter. 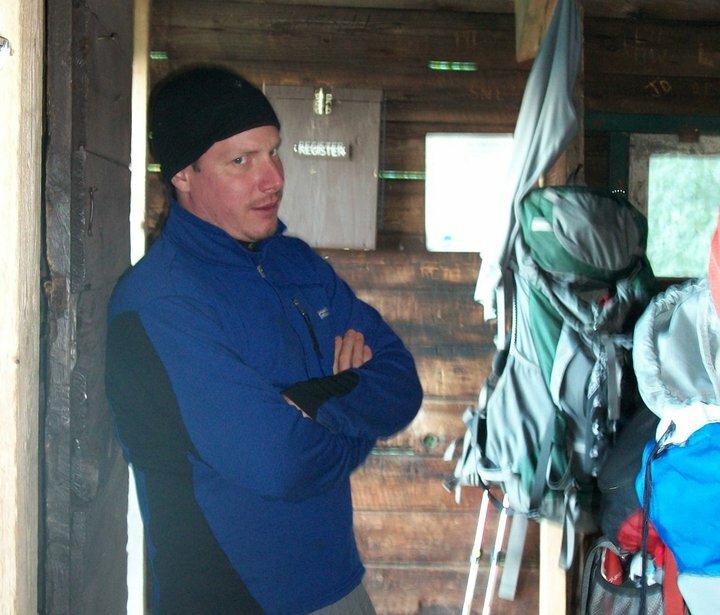 The most important lesson, though not just for the trail, is to remember to communicate often and honestly. Without that communication, any trip has the potential to be a disaster. Instead we woke up cozy and warm and able to laugh about our not so epic adventure. Happy Valentine’s Day! Before you head out: Put the rice in a zip lock bag. In another zip lock you can combine the rest of the dry ingredients. In a small sealable container you can put the diced chipolte and tomato paste. The other ingredients all pack just fine. At camp: This is a two stover. In one stove start your rice with 1 cup of water. In the other stove (one that has a good simmer) bring the other cup of water to a boil and add all you other ingredients. 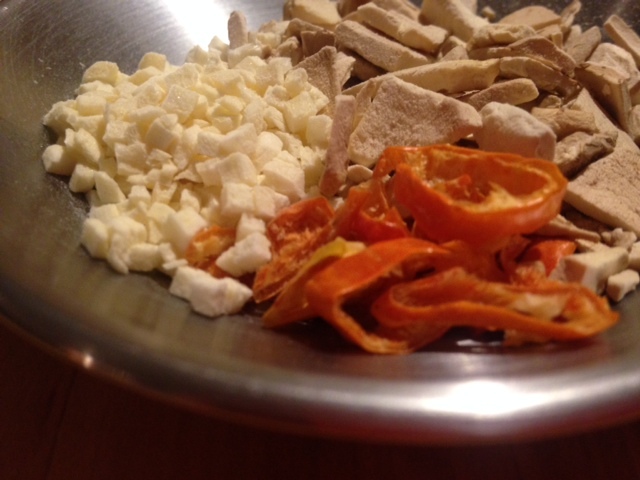 Reduce to a simmer and cook until your freeze dried veggies are tender, about 10-15 minutes. If it looks like the sauce is getting too thick just add some water. 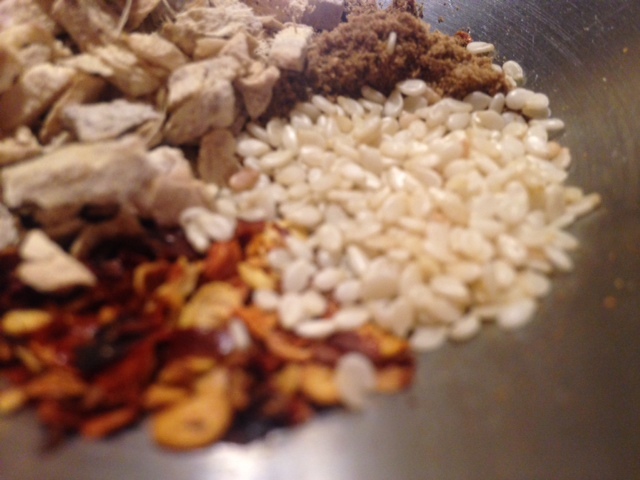 When everything is done, serve the Mole over rice. For easy clean up spoon everything into tortillas and wrap it up. 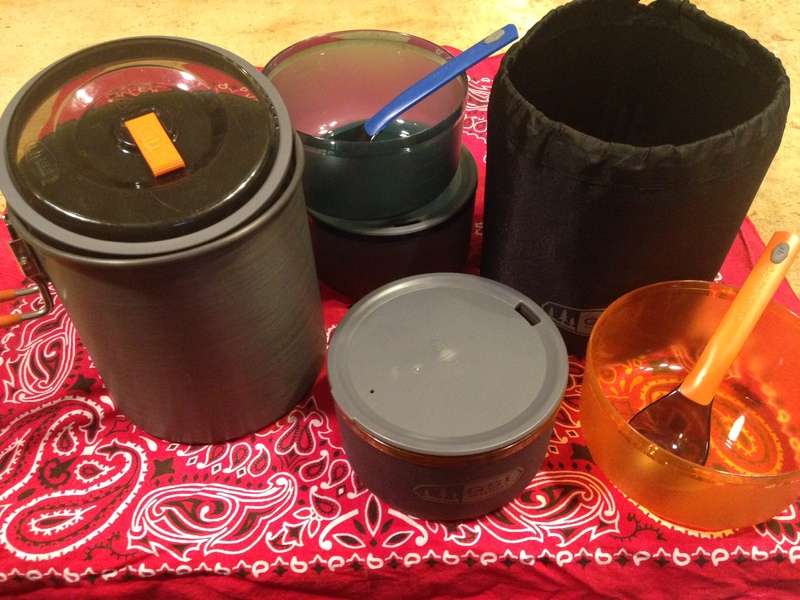 One stove option: Put both cups of water into your pot, bring to a boil and add ALL of your ingredients. Reduce to a simmer and cook until your rice and veggies are tender. If things start looking too goopy, adjust by adding water as needed. 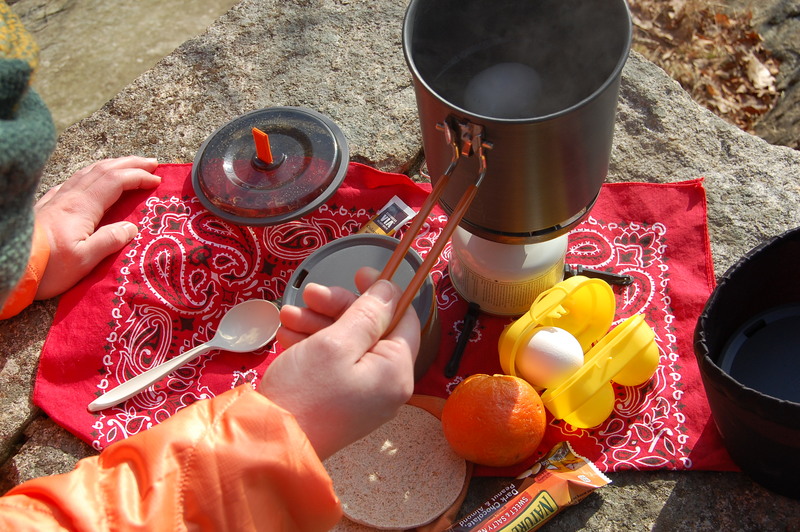 There are many schools of thought about breakfast on the trail. 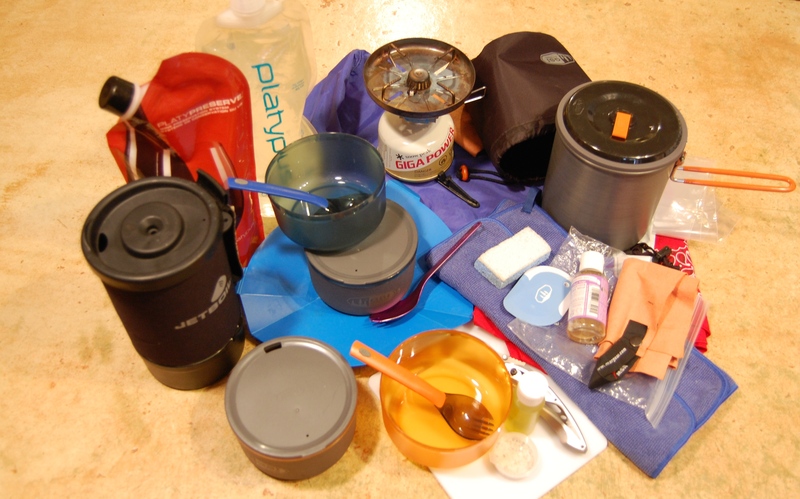 Everyone has different things they are looking for – speed onto the trail, ease of clean up, light packing weight, how much water you have to work with etc. Some folks mix Carnation instant breakfast with oatmeal for added nutritional density. Some just slam a Gu packet and then power out. 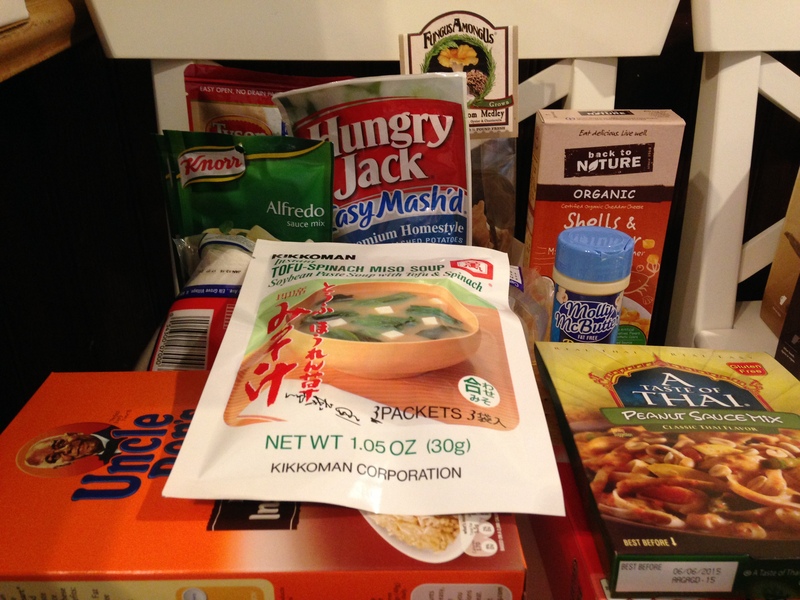 Others break out the freeze dried pouches of eggs or granola. A few just pack and go, stopping for breakfast once they are miles down the trail. 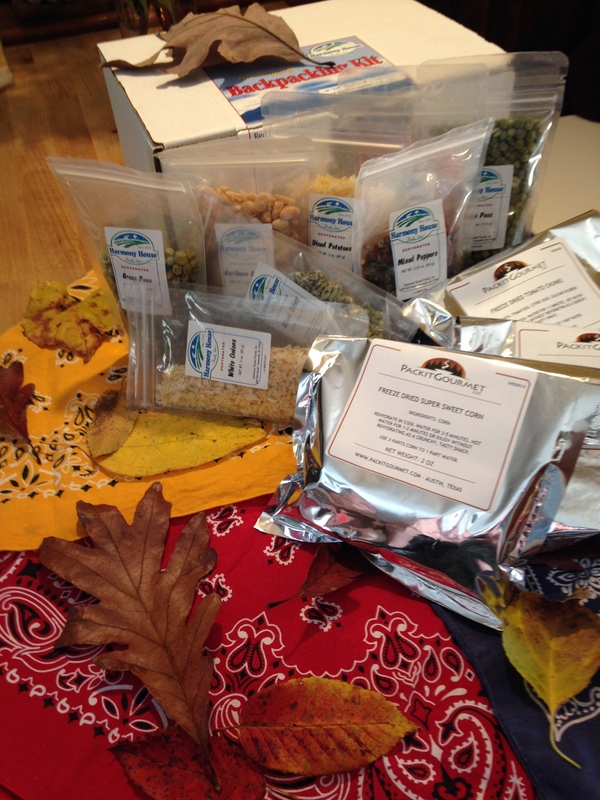 Cheryl is happy with a couple packs of instant oatmeal mixed with a Justins’ Chocolate Hazelnut butter and a coffee of questionable quality before quickly stretching her sore legs, popping some Advil and hitting the trail. Graham however, is not a man who looks causally upon the start of his day. There must be good coffee, good noshes and a bit of puttering to be had before he’s ready to put his pack back on. At this point of the day he is far less concerned with our speed in getting back on the trail than making sure his hungry belly is fed. Cheryl has decided that its much better for Grahams health if she indulges him in a little morning putter and warm breakfast than if he must be taken by the throat and throttled an hour down the trail due to ill temper. In our search to find Grahams trailside morning Zen the path has taken us down a few wrong turns. We have tried scrambled eggs with chorizo… and found that while they were delicious there is far too much clean up and it will leave you with a stinky egg pan to carry. We’ve tried a freeze dried version of biscuits and gravy… WAYYYY too much clean up and so terrible tasting that we wound up not eating it. 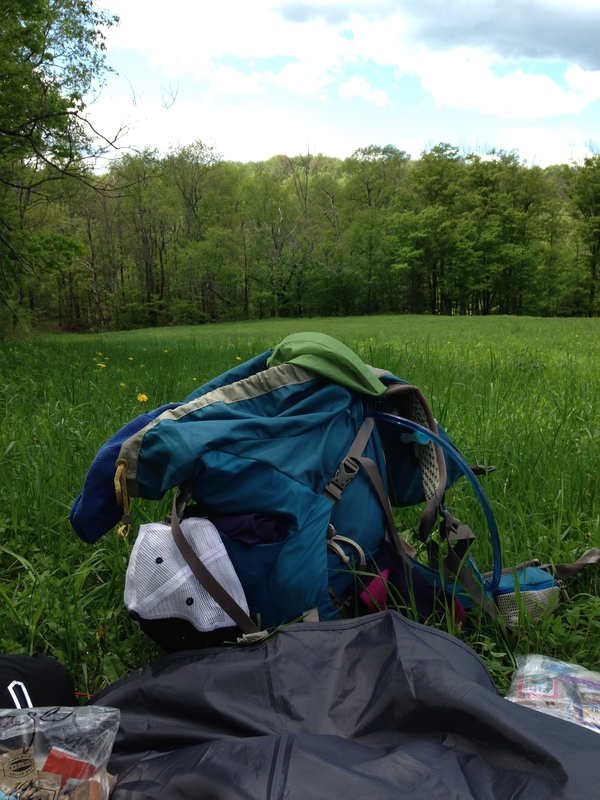 Instead we wound up packing most of it back into our packs and carrying it another 2 days before getting off the trail. So Gross!! 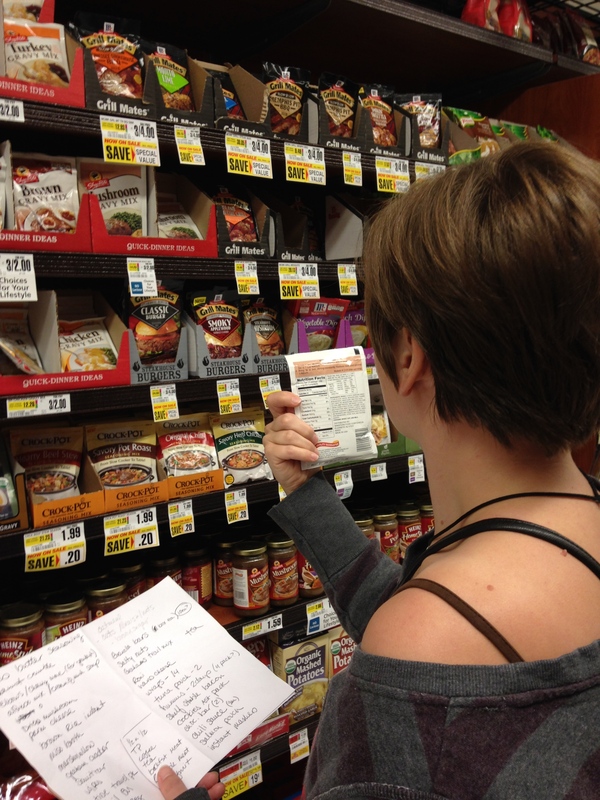 We did Cheryl’s version of oatmeal and go… once. But this time was going to be different. This time the essentials had been gathered. 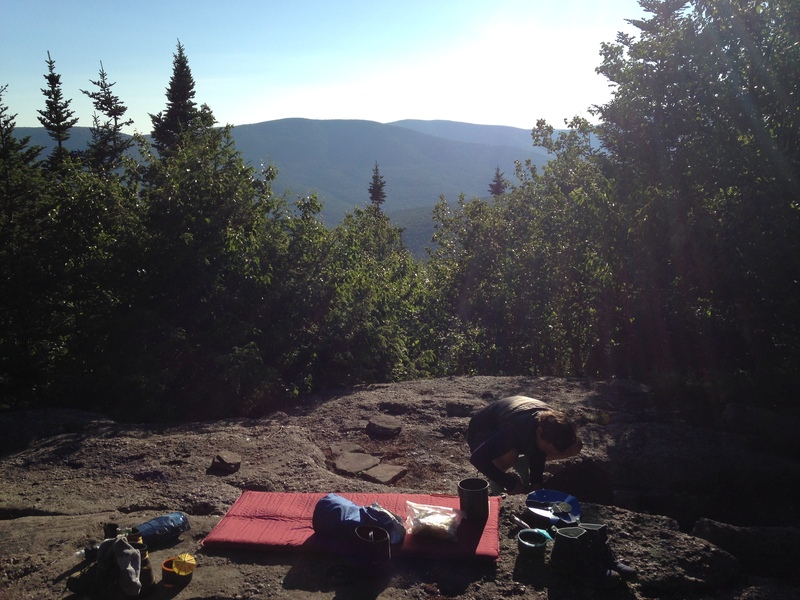 This morning on the Escarpment we finally woke up to sunshine – after two nights of rain it was clear that this morning would be perfect to test out our next puttering Zen breakfast attempt. Wheat toast, hard boiled eggs, Starbucks and some fruit in the pack. What ensued may have been our most successful meal of the trip. On this trail we had enjoyed two nights and a full day of rain. We found our tent and rain gear to be awesome at keeping us dry – even our sleeping bags were still dry. We learned that we could break down and pack our tent body while remaining underneath the rain fly to stay dry. We had enjoyed the company (and whisky) of four crazy dudes the previous evening that had thrown a mini rave in their lean-to by using their headlamps on flash mode and cranking their iPod as the rain poured down. And now best of all – we had found there was hope for Grahams morning Zen! 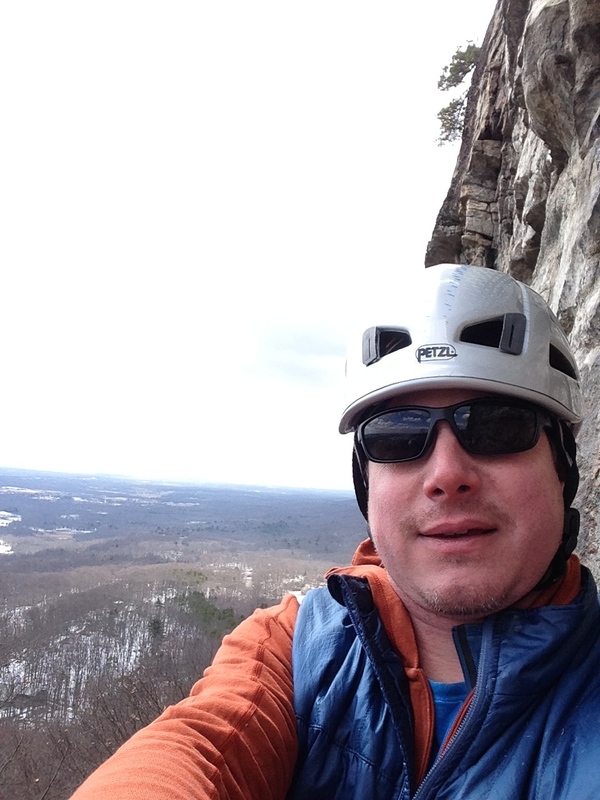 Love this escarpment Trail! 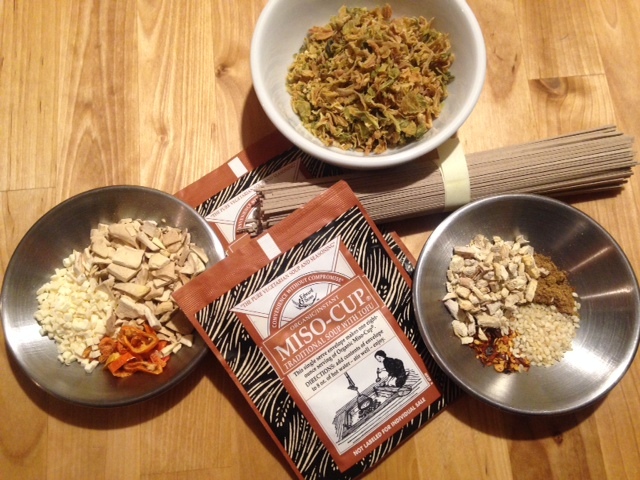 gather your Chi: Starbucks Via – pricey but worth it. Pepperidge Farm Wheat Thins – they’re already flat, you don’t have to worry about your bread getting squished! Two eggs – and the carrier is clutch. An orange – heavy but if you’re just out for a couple days – worth the weight for the intensity of fruit flavor hitting your taste buds. And a little something to snack on while you wait for your egg to cook – Nature Valley granola bar. 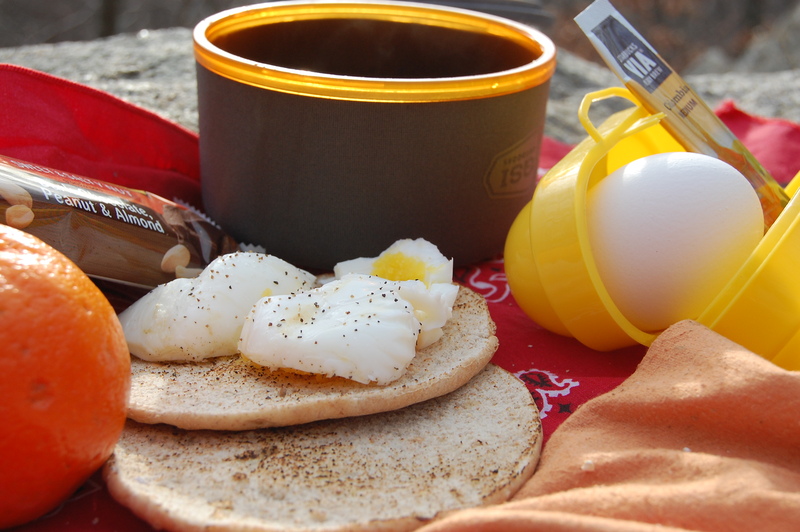 the path to tastefulness: put your eggs in the water cold and bring to a boil. when water has has boiled you can make your coffee. 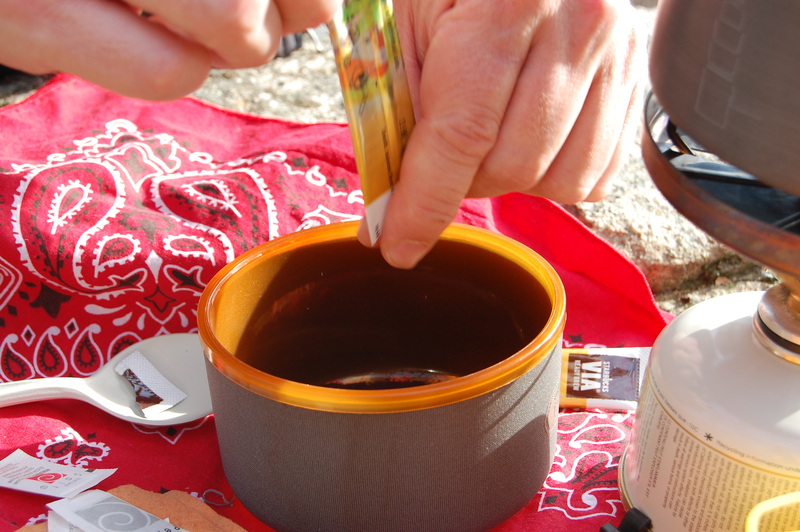 Just pour a little of that hot water into your cup with the Via. Meanwhile a allow the egg to rest covered in the remaining hot water for 10 minutes. For those sqeamish about making coffee with your egg water, you could boil water seperatly for coffee. …and then the other. We “butter” our toast with a little extra virgin olive oil and a sprinkle of salt. 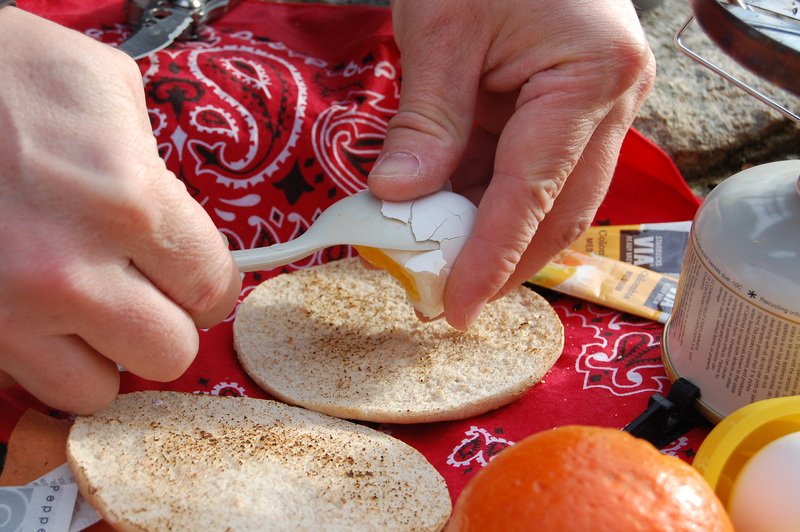 when your egg is finished and cool enough to touch the outside shell without cursing fold open your pocket knife and gently press your cooked egg to cut it, shell and all, in half over the blade. 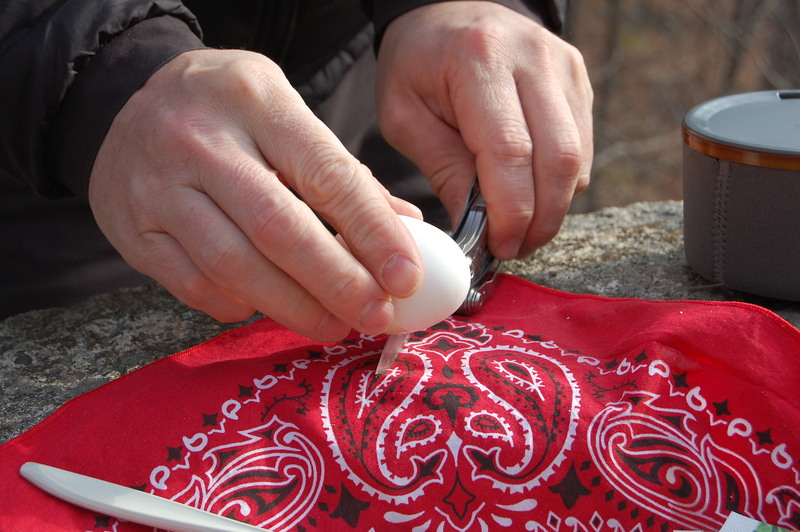 If that makes you nervous protect your fingers by holding the egg in a cloth. 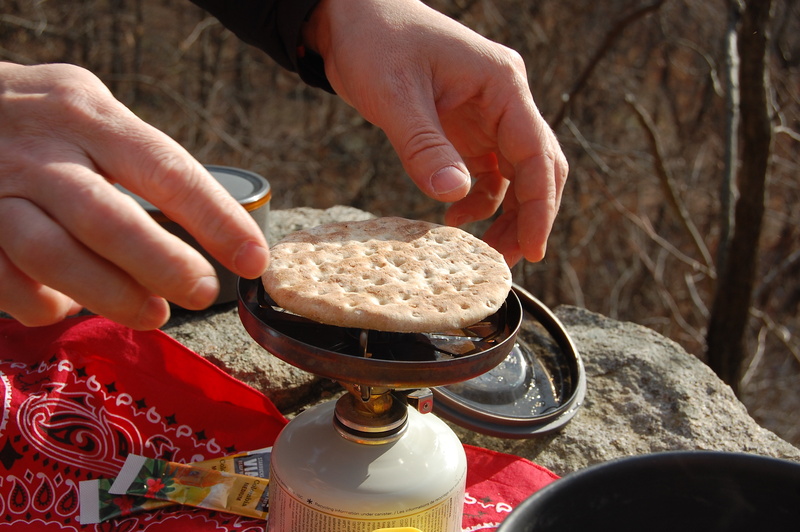 and smash on your lusciously toasted wheat thin. 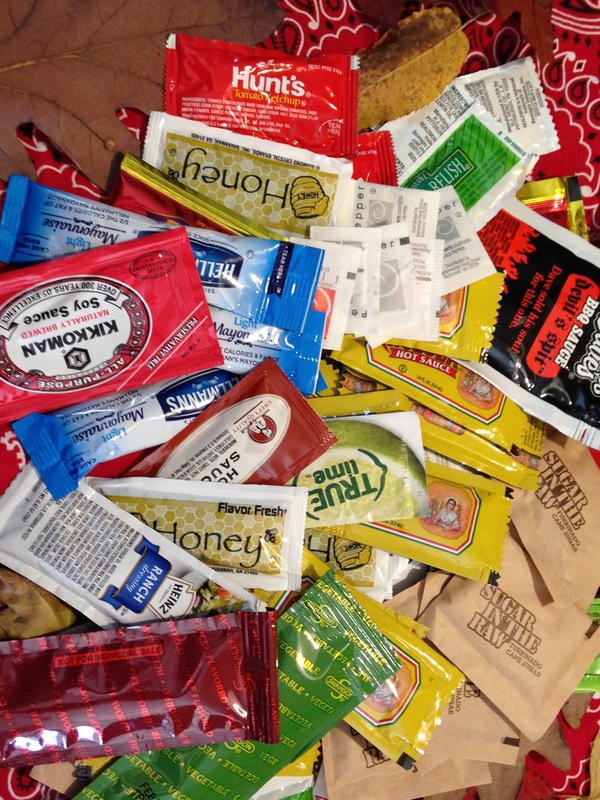 Season as you like – salt & pepper, ketchup? hot sauce? slice of cheese? precooked bacon you warm over the flame? the result: enjoy as a sandwich! Genius!! Enjoy your moment of breakfast Zen. 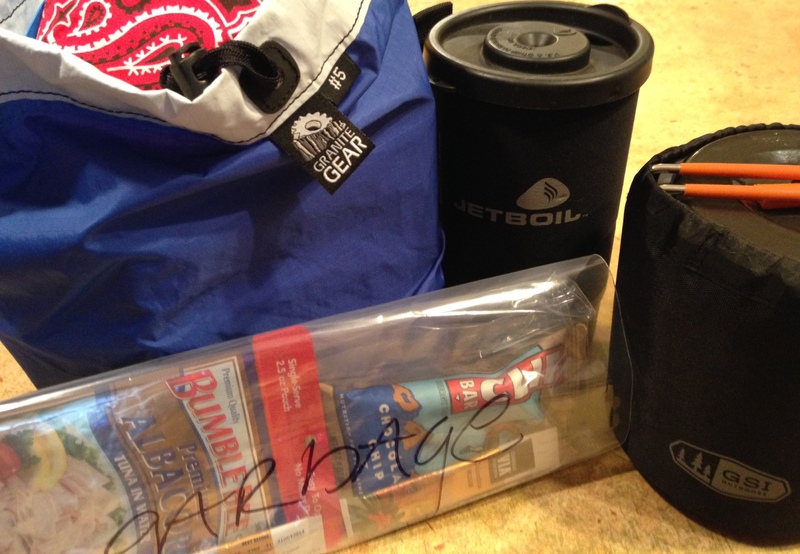 Imagine this scene: You’re on the trail backpacking, mid summer and you have 20 miles or more left in your trip. 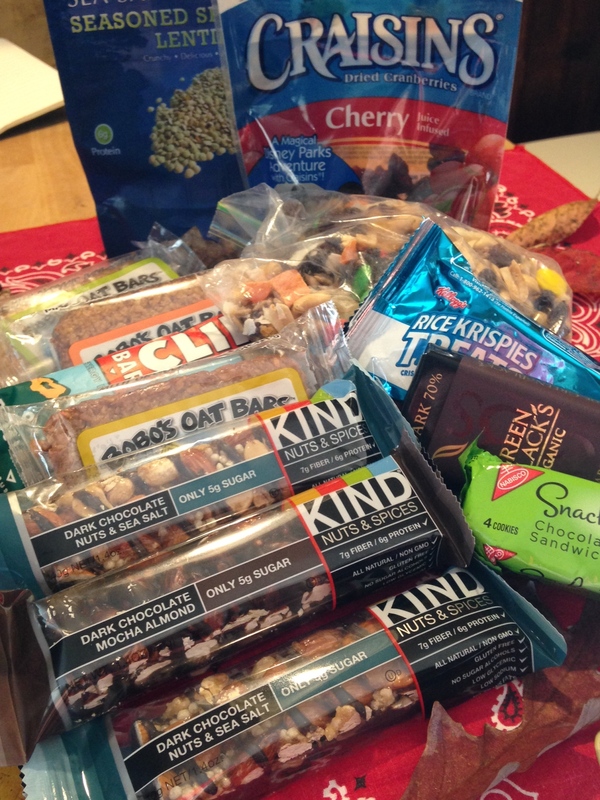 With two days of solid mountain hiking behind you, you’re Hungry. Capitol H. Heck, capitol everything else – HUNGRY. 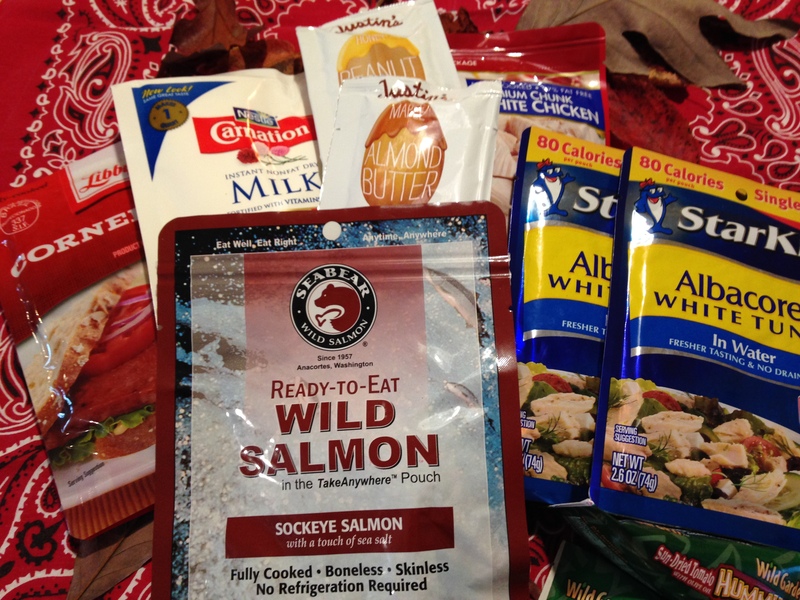 The kind of hungry that makes freeze dried pouches of nonsense edible, and a Cliff bar for dessert sound good. Hungry. The trail is gorgeous, the weather is great and your companions couldn’t be more fun. But this much exertion requires a good amount of food input and you just can’t stop thinking about it. You think of pizza – thin slice, Brooklyn style – the kind you fold in half to eat. Of tall lovely glasses of lemonade with ice, making condensation drip down the sides of the glass and that sweet / tart liquid that would just make your taste buds sing. You think of thick cuts of juicy red meat topped with blue cheese or sautéed mushrooms or… Well, you understand. You think about Food, all the delicious, delicious food that you’ll have. Just as soon as you leave the trail that is. You look down in your hand at the somewhat sawdust-like nutrition bar your clutching, sigh deeply, choke it down and keep walking. Just such a scene was deep underway a couple years ago in early August, Green Mountains VT. Day two of a three day trip and four of us were stopped for the night in a lovely little cabin on the Long Trail. Laughing and joking with the others, we were heating water for our pouches of freeze dried Thai while snacking on some hard sausage, cheese and bread Cheryl’s brother Chris had brought. 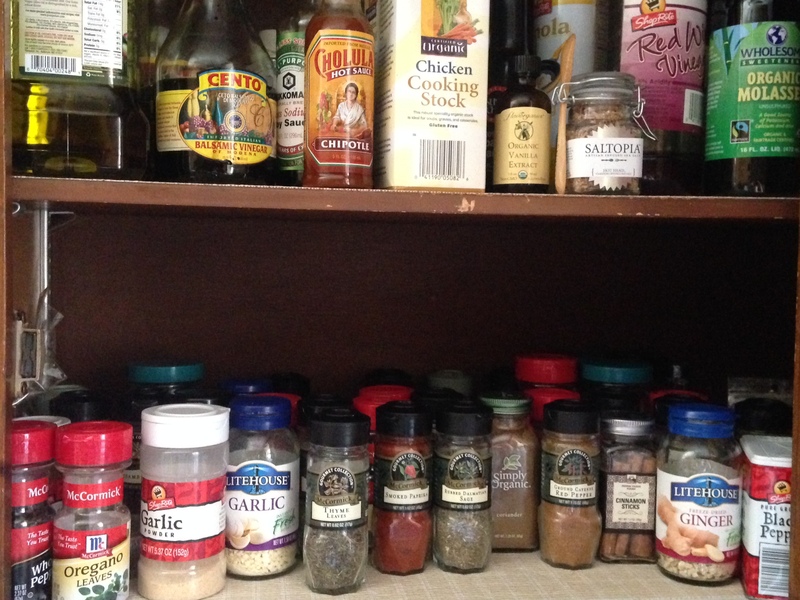 Suddenly Chris breaks out a garlic clove, shallot, and (wait for it…) a 1 oz vial of olive oil?! Wait. What the deuce?! Is this guy seriously sautéing said garlic and shallots and adding it to rice?! Holy cannoli!!! That SMELLS GOOOOD!!! Graham and Cheryl look at each other in shock – one thought between them. “How could we have missed the boat on this gravy train?” Between us we have over 30 years in kitchens and not once did the thought of a trail side sauté occur. 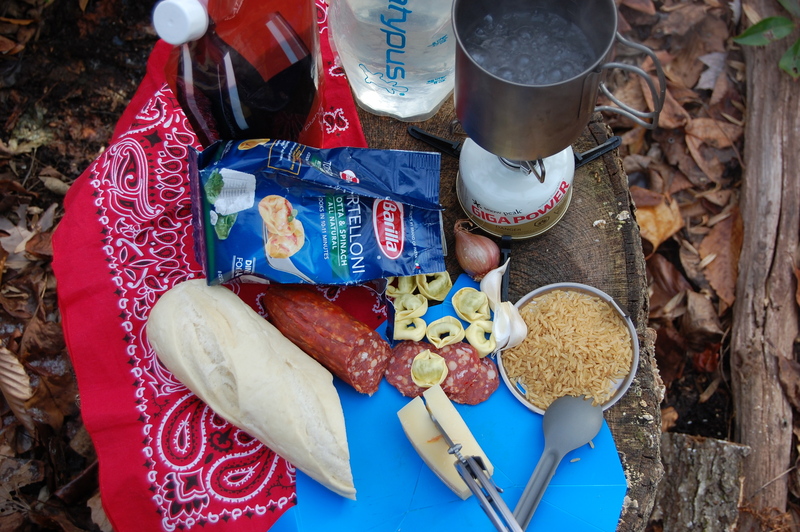 Aspiring trail gourmand Chris now adds bouillon and freeze dried tortellini to his pot, reduces the heat and covers it. Casually leaning back he snags a slice of parmesan and proceeds to pour himself another glass of wine. Our minds blown we sat still in shock. Our Peanut Thai had suddenly lost its appeal. Fortunately for our tummies and taste buds,once we recovered from our chagrin, we approached that scene with a singular decision, “challenge accepted”. 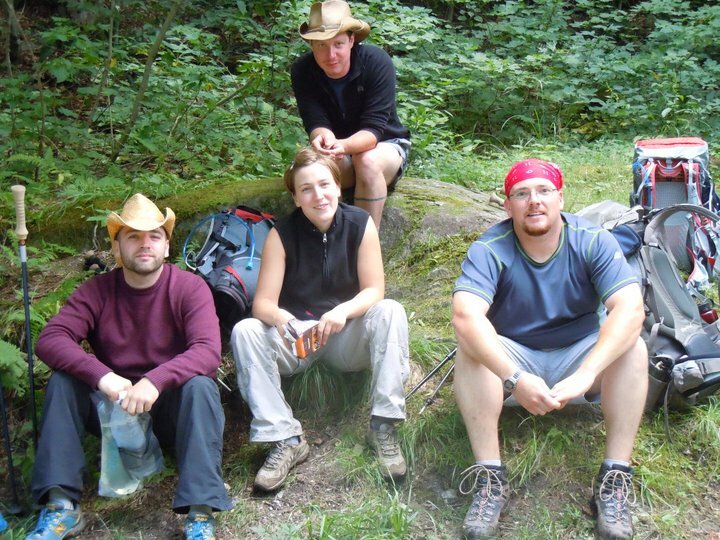 We have since traveled our own food journey that has included hiking and backpacking, pairing food and cocktails, snowshoe adventures (BTW – salad for lunch is a poor choice when the weather under 30 degrees), canoe camping mishaps, and cliff side rock climbing lunches. We have had triumphs and failures but continue to enjoy every adventure. 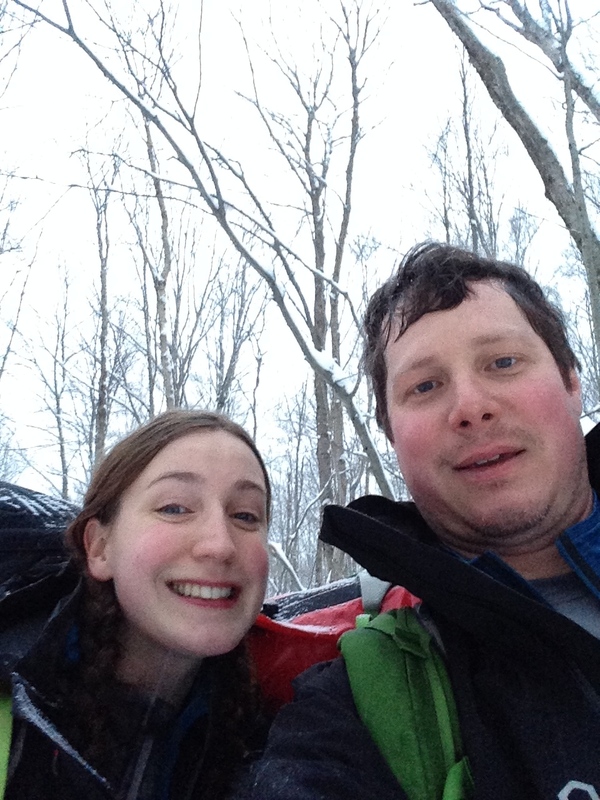 From these experiences we present to you – Two Hungry Hikers. 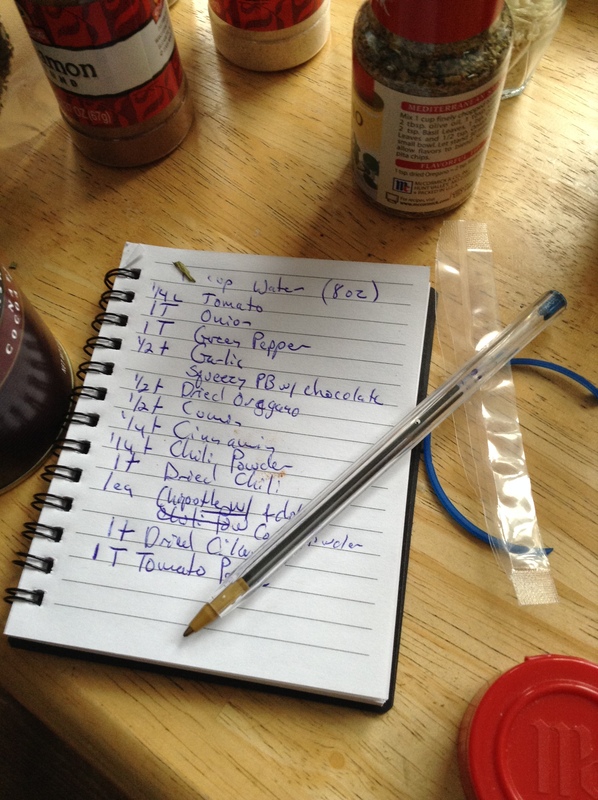 A diary of sorts, covering the very thing you cant stop thinking about… Food. 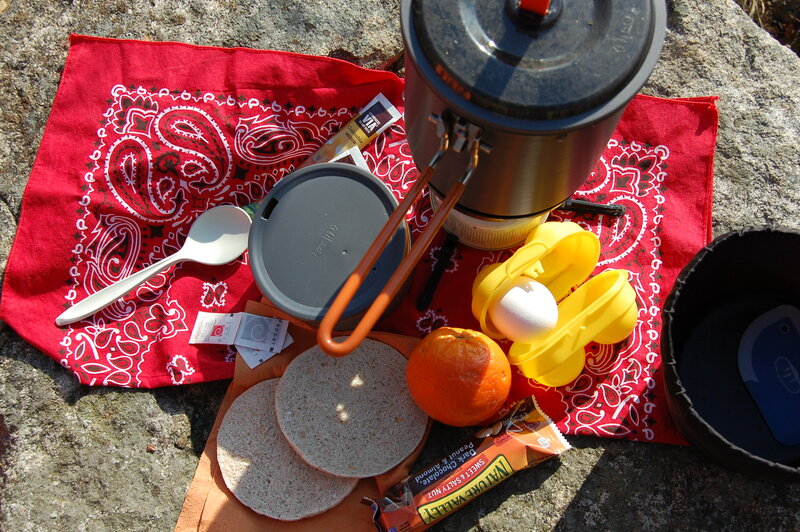 And how to enjoy the adventure of preparing it outside. Bring the water to boil and add the rice, tortellini, and bouillon. Reduce heat a bit to save fuel and stir every couple minutes to keep the rice from sticking to the thin titanium. When the rice and tortellini are almost done, dump in the pepper and basil mixture. Cover and let cook until tortellini are done.